A beautiful set of genuine ivory keytops on a vintage piano is becoming more and more of a rarity. Many ivory keysets on older instruments have suffered from wear and tear over the years, and are not particularly attractive. Bringing an original set of ivory back to “factoryfresh” condition is at times possible when done by the professional technician, but it can be very timeconsuming, and the techniques involved to do the work correctly are painstaking. 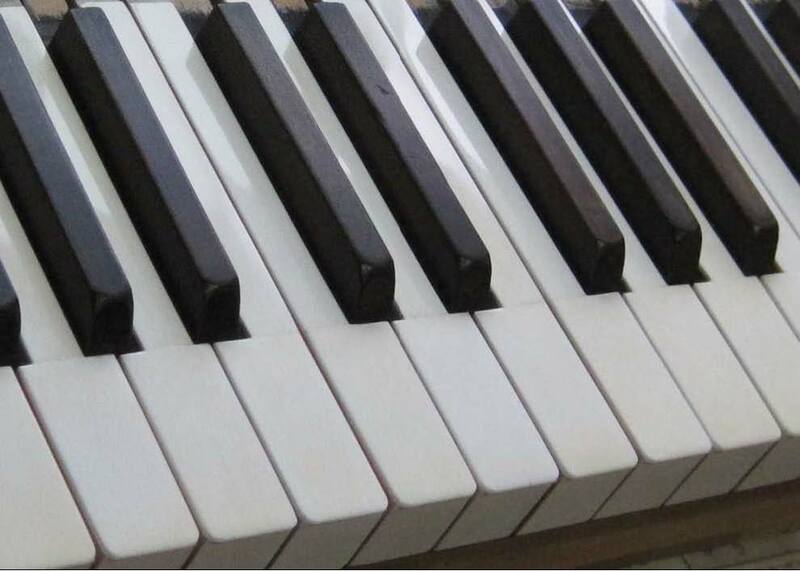 The keytops on your piano are to the point where something could be done to enhance their appearance. I would suggest that a professional job of ivory keytop restoration should be one option to consider. What are the other options, if I want a nice looking set of keys? Oftentimes, owners of older instruments choose to have old, chippedup or yellowed ivory removed to be professionally replaced with highquality plastic tops. When done correctly by a qualified technician, such replacement keytops can turn out to be very attractive and durable. When restoration of original ivory is possible, however, the results can be beautiful. Compare the ‘after’ shot of the keytops in the photo above, with the ‘before’ shot of the same set of keys on the cover of this article. Ivory keytops not only look beautiful, but they have a luxuriously silky feel, which plastic tops simply cannot duplicate. Will restoring the original set of ivory keytops substantially increase the value of my piano? To be honest, probably not as much as the work will cost. Many pianos, especially older uprights, consoles and spinets, do not bring top dollar in today’s market, no matter what the condition. There are just too many “free for the hauling” pianos available on Craigslist and in local shoppers. Ivory restoration could possibly make your instrument easier to sell for a reasonable price, but marking it up substantially (and being able to sell it for an increased value) is unlikely. While the commercial value of your piano might not increase as much as you would like, if you really love your piano and have no intentions to sell it in the near future, the investment you make to have the work done can give substantial returns in terms of your appreciation for the beauty of your vintage instrument. Pianos built during the age when ivory keytops were the norm are oftentimes gorgeous in sound and appearance, and having genuine ivory covering the keys gives the piano a solid, authentic feel. Is ivory as durable as plastic? No, at least not as durable as the new highquality plastics that are used to manufacture keytops. 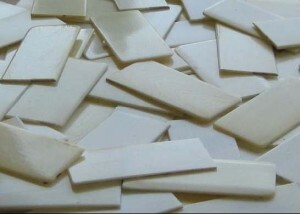 Ivory, especially old ivory, is more easily chipped than plastic, and can be prone to splitting. In a household where young children live and play, plastic keytops are probably a more sensible choice. A determined 2 or 3 year old left alone with a metal Hot Wheels car can wreak havoc on a set of ivory keys in short order. For a home with no small children ever left unattended in the vicinity of the piano, however, ivory will last indefinitely when given proper care. Do all ivory keytop restoration jobs cost the same? Given the difference in condition of keytops to begin with, there is no way to give a set price that will apply to every set of ivory keytops. For starters, the number of chipped or missing keytops will affect the price. The more tops needing replacement, the more time will need to be spent sorting through my collection of old keytops to find ivories that will blend in. Also, if a number of the original keytops have popped off or are loose, consideration should be given to how many keytops should be reglued. If tops are coming off already, the safest course of action is to remove them all and reglue the entire set. It is only by doing so that any guarantee can be given about whether the tops will stay on in the future. Finally, the issue of yellowing may have to be addressed. If the old keytops are severely yellowed, special bleaching techniques will be required to lighten them up. This takes even more time and a high degree of skill. Can every set of ivory keytops be restored? Sometimes the old ivory is in such bad condition (as in the photo above) that restoration of the original ivory is impossible. There are a few technicians around the country with access to legal sources of ivory who can recover old keys with new ivory keytops, but the expense of such work can be extremely high. Where would the work be done, if the decision was made to restore the ivory keys of our piano? Also, how much would the work cost? Except in situations where only a simple cleaning is called for, most restoration work of this type would be done in the shop. I would need to remove the keys and possibly the keyframe from the piano to take with me. Once the keys are returned to the piano, the set of keytops should also be leveled. This work, on a vertical piano at least, is ordinarily done in the home. 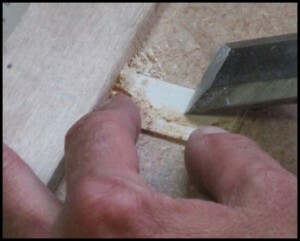 On a grand piano, the initial leveling might be done in the shop, but usually a more exacting job is done at the piano. As far as the cost is concerned, I would be glad to give an estimate before the job is begun. Depending on the current condition of your keytops, the time required to complete the job could range from several hours to a day or more. As with any restoration job, my concern is not so much how quickly I can get the work done, but rather how effectively I can work to get the job done right, without having to cost you an excessive amount. What are the basic techniques used to rejuvenate keytops? Is it something the owner could do himself? Not if you wish to achieve professional results which mimic a factory job in appearance. The methodology used to restore a keyset is painstaking and one that requires a great commitment to quality. In that my reputation is on the line with every job I complete, my goal is to provide the quality of workmanship to you which will do both your piano and my reputation justice. 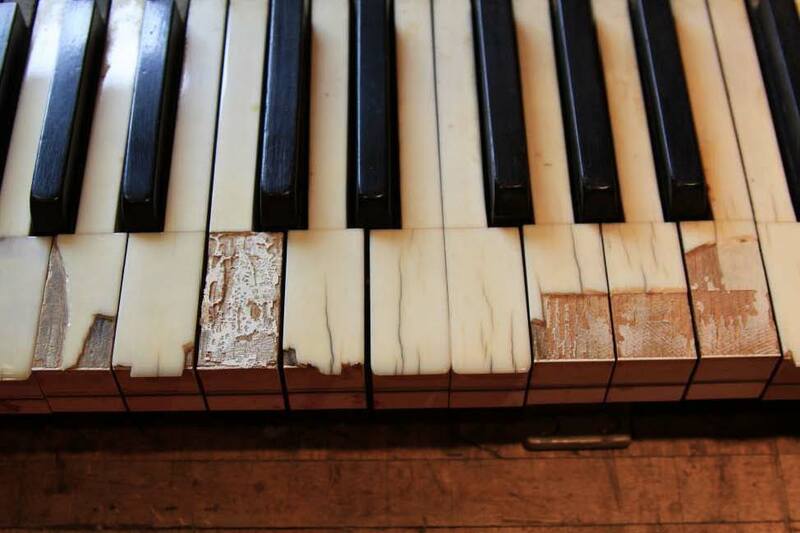 My first concern will be to find suitable ivories to fill in for chipped, cracked and missing keytops. Here’s where you can help, by making sure you don’t have any ivories that have popped off stored away in a drawer or cupboard. Having the original ivories to work with makes the job much easier. When the old ivories are damaged or missing altogether, I will do my best to find replacements that will blend in from my collection of recycled ivory. Exact matching of any replacement ivories with remaining original ivories is usually impossible, in that there are too many variables. 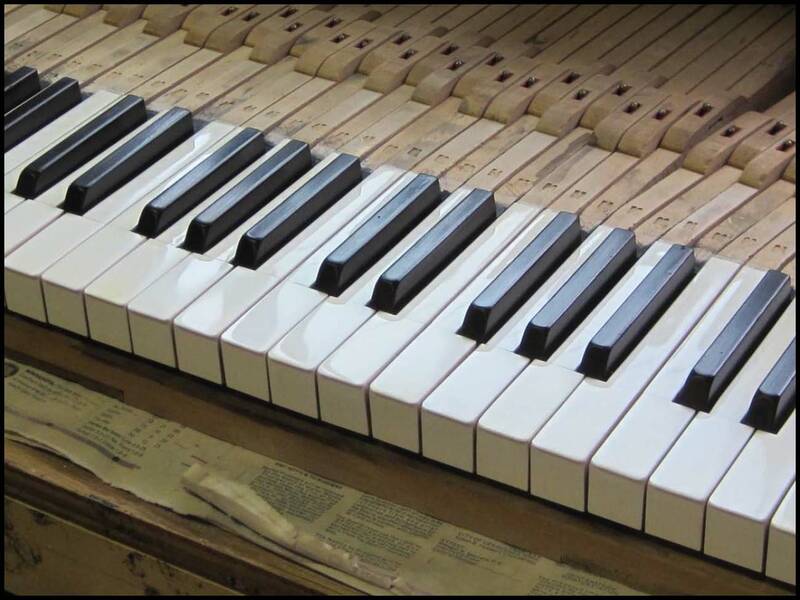 However, with proper techniques the new ivories should blend in well with the old, so that differences are not highly noticeable. 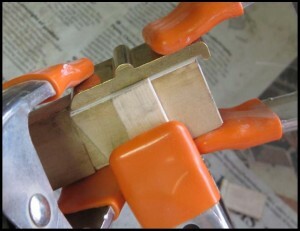 Next, any keytop which has been inexpertly glued to the keystick in the past must be removed and prepared properly. Many times an instrument will have ivories which are poorly glued, so that discolorations show through the translucent ivory. The only way to fix this problem is to remove the keytop and scrape the old adhesive off completely to start over with a proper job of gluing. In situations where keytops are loose to the point where they are popping off unexpectedly, the only real solution is to remove them all, (usually both heads and tails) to reglue with proper methods that will ensure they stay put in the future. This is one potential aspect of the job which would add a great deal of shop time to the job. 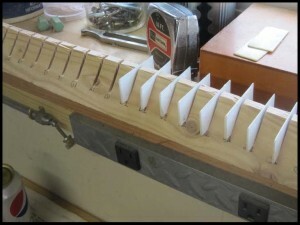 The process used in gluing and clamping is done with a precision that will give results similar to what was achieved at the factory when the piano was brand new. It is only by treating each individual ivory on your piano with this amount of care that the results can be deemed truly professional. With this type of quality workmanship, you’ll have an instrument which will bring compliments from every guest who sits down to play. While your keyset is in the shop (if you decide to have me do either the job of ivory keytop restoration or a replacement job with new synthetic keytops), it would be the ideal time to do whatever other work the action or keys of your piano might need. If you wish, I would be happy to write up a comprehensive itemized estimate of all the repairs which would benefit the sound, the touch, or the appearance of your piano. This is obviously not a decision you’ll want to make without giving some serious thought to the options. Please take your time in reviewing this material, and contact me if and when you decide to begin the process. Another shot of the same set of ivory keytops featured on the front of this article.